Pre-heat your oven to 170c. Grease and line a 20cm round springform baking tin. Melt the chocolate over a hot water bath and allow to cool slightly. Whilst this is happening cream your butter and sugar until light and fluffy. Add the egg yolks one at a time making sure that they are well combined. Add in the chocolate and hazelnut meal and mix. In a separate bowl whisk your egg whites until they are soft peak. Fold 1/3 of the egg whites into chocolate mixture. Once combined add in remaining egg white, folding gently until just combined. Spoon mixture into baking tin and level right to the edges. Bake for approximately 50-60 minutes or until the cake sets in the middle and a skewer can be removed cleanly. Remove from oven and allow to cool in the tin before removing. For the ganache, place the cream into a small saucepan and heat over a medium heat until bubbles are just forming. Remove immediately and add chocolate, stirring only just enough to combine. Pour over cake and using a metal knife or palate knife smooth around edges. Having a glass of hot water to clean your knife as you go will help in this process of cleanly getting a good surface. 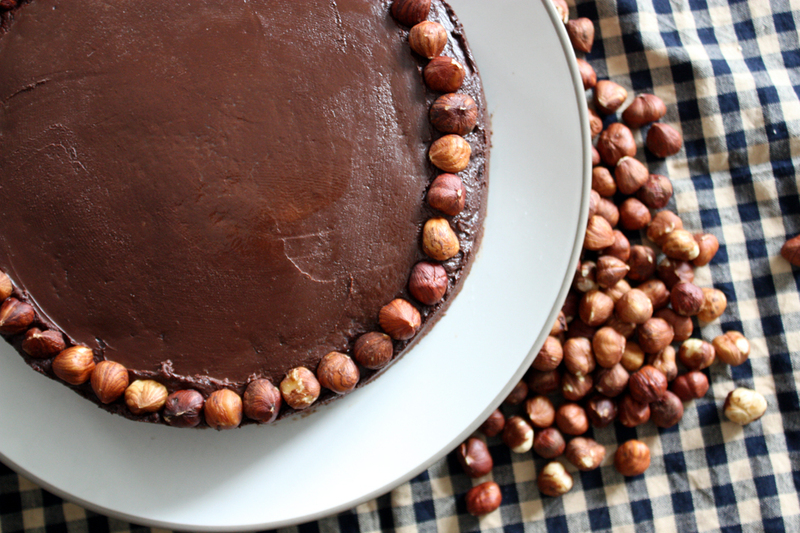 Place the hazelnuts around the crown of the cake whilst the ganache is still warm. Allow to cool completely before serving. This cake will keep for a few days. Serve with double cream or a berry sauce.